I know this is the worst thing to admit to, but I always hated wearing facial sunscreen because it always felt too heavy. Neutrogena’s liquid version changes all that. It has a thin, runny consistency that seems strange at first, but it goes on smoothly and absorbs quickly so that you can layer your regular facial lotion on top almost immediately. 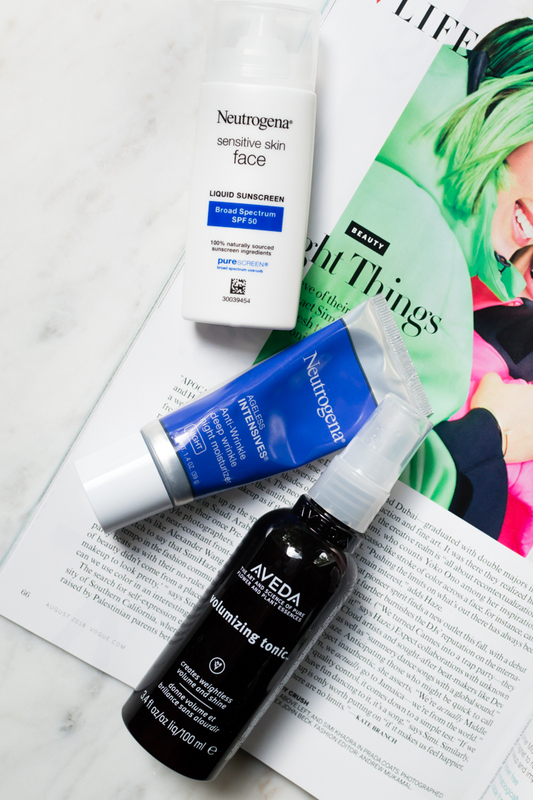 It’s no secret that I’m getting older and to help combat signs of aging, I’ve been exploring different retinol treatments. I first tried this RoC night treatment and it only served to irritate my skin, so I had been a little put off by the whole thing. Since I typically like Neutrogena products (#NotSponsored #WishItWere), I opted to give it another whirl with this night moisturizer. I haven’t noticed a visible reduction in fine lines in the two weeks I’ve been using it (I’ll report back once it’s empty), but I have noticed an overall improvement in the texture of my skin. My skin feels unbelievably soft in the morning after using it and layering this serum on top. This spray promises to create weightless volume on fine hair, and it does just that. I found that it works best when you blow dry your hair most of the way and then spray this into the roots before finishing. (When I use it all over on wet hair, it makes my hair feel staticky.) As an added bonus, I’ve found that it helps my fine hair hold a curl longer than hair spray alone. On another note, I tried a sample of Aveda’s thickening tonic and I love it, too! My hair doesn’t seem nearly as limp late in the day when I use it. 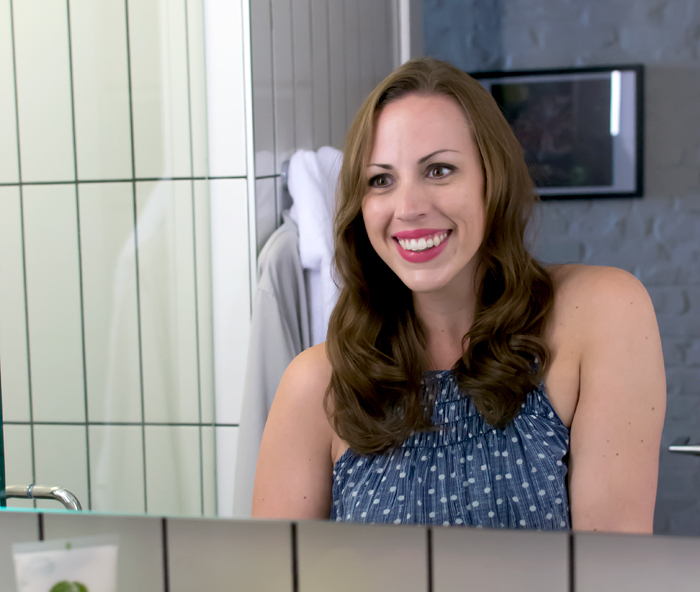 Don’t you just love when you find an inexpensive item that becomes so integral to your routine that you couldn’t imagine your life without it? Me, too! Which is why I was so excited to take part in the first-ever blog linkup for <em>press themes that challenged participants to share their must-have items under $50. 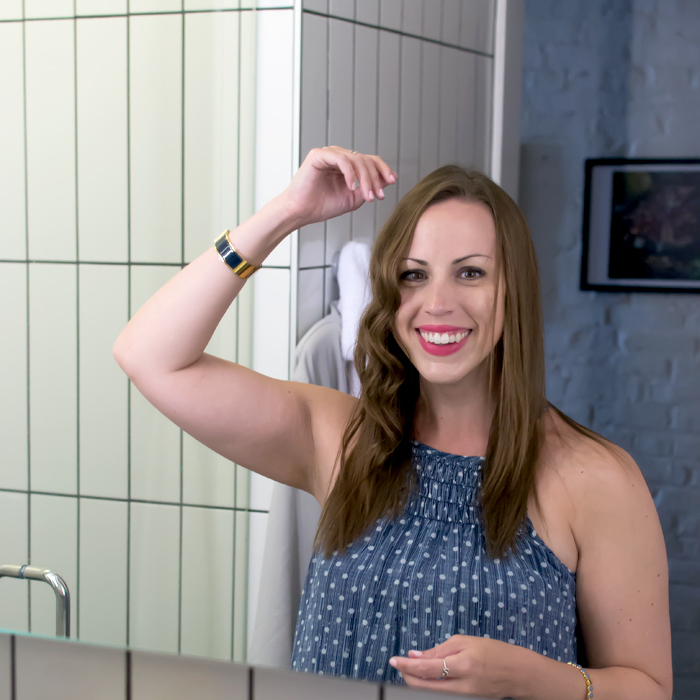 Below, you’ll find five of my everyday essentials along with a list of other people who are divulging their favorites. Be sure to share your own in the comments! I’m all for any new-to-me products that can make my life easier! If you suffer from dry flaky skin, you need to add this serum to your beauty arsenal. This is the only thing that has worked to keep flakiness at bay and keep my complexion smooth. I apply one pump of product and follow up with moisturizer once it’s absorbed. 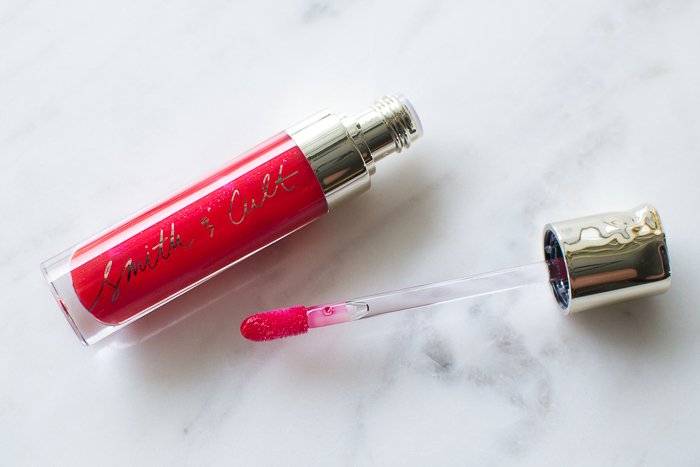 The texture of the product doesn’t feel luxurious — and sometimes a little sticky — but after you smooth it on and leave it for 15 minutes or so, it disappears into your skin and feels weightless. In the morning, those little flakes have miraculously disappeared leaving my skin smooth and soft. The price is steep at $36 per ounce, but you really don’t need a lot of product at a time. Full wallets take up so much space in a purse, and it’s space I don’t really have given my affinity for small crossbody bags! A few years ago, I purchased a small card case like this one (Kate Spade ones often go on sale, too) and haven’t looked back since. It takes up barely any room to bring along my true must-haves — driver’s license, credit card, debit card, and $20 worth of cash — freeing up space for my other daily essentials. I keep my wallet handy in my closet for additional credit cards, gift cards, and loyalty cards. I’ve had these tweezers since college and they’re the absolute best at plucking stray hairs and they’re sharp enough to grab even the most pesky ones. If your tweezers ever get dull, you can send them back to Tweezerman to get sharpened for free. This portable charger is one of the most useful items under $50 that we own. We purchased it before we went to Copenhagen back in 2014 and were incredibly impressed with its staying power on the trip. It can fully charge an iPhone five times before its battery depletes and the relatively slim profile makes it easy to carry around all day. Plus, you can plug in two phones at once. Not only do we bring this charger on every vacation, we typically carry it with us when we’re out on the weekend. It’s small enough where Dave doesn’t mind putting it in his pocket if my purse space is at a premium. What are your favorite items under $50? Share in the comments below! 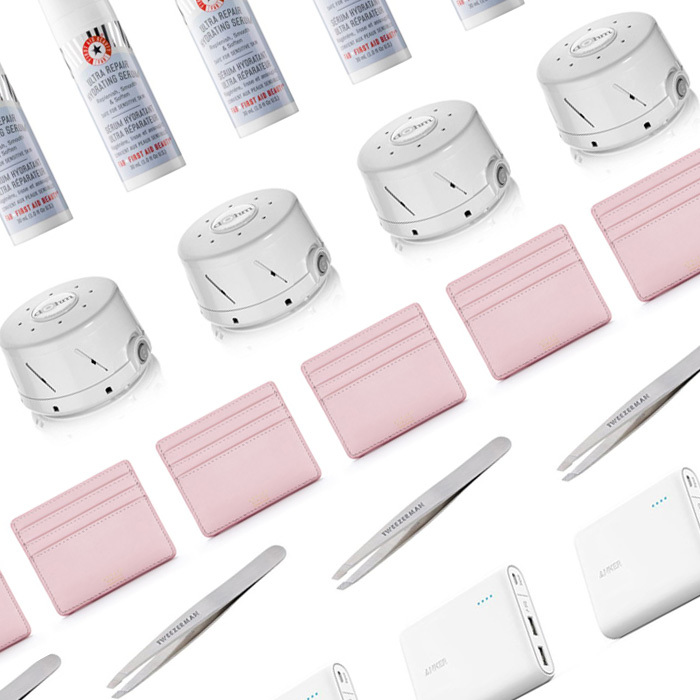 Visit the following blogs to see other must-haves under $50! 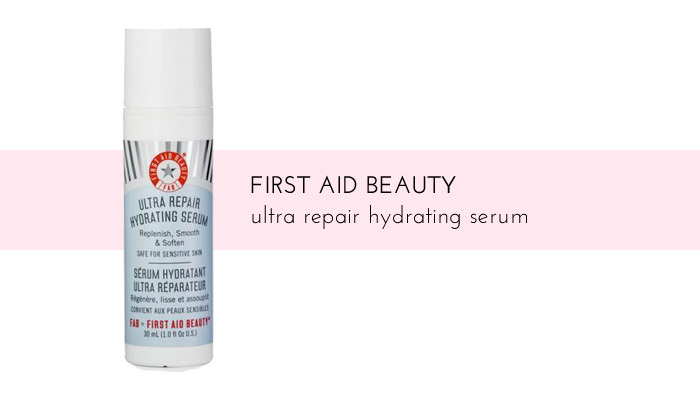 If you suffer from dry flaky skin, you need to add this serum to your beauty arsenal. Once the humidity lessens in the fall and winter, I can’t escape flaky skin no matter how many masks, lotions, and exfoliants I use. This is the only thing that has worked to keep flakiness at bay and keep my complexion smooth. 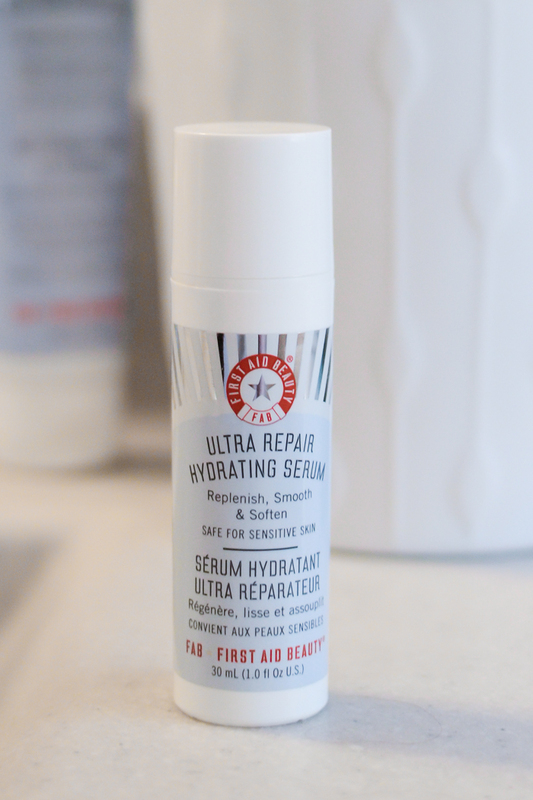 The marketing spiel: Formulated for all skin types, Ultra Repair Hydrating Serum instantly infuses skin with essential hydration to help plump and minimize the appearance of fine lines and wrinkles. Its lightweight texture makes it perfect for layering under your favorite AM and PM moisturizers. Hyaluronic acid—a moisture-locking agent—helps hydrate, plump, and nurture. Peptides help minimize the appearance of fine lines and wrinkles, while collagen helps skin appear more plump and replenished with an improved-looking texture. Colloidal oatmeal, along with aloe leaf juice, help calm and soothe irritated skin for an allover healthy-looking and feeling complexion. My thoughts: I apply one pump of product to my face at night after washing my face whenever my skin looks flaky. The instructions suggest following up with moisturizer once the serum is fully absorbed, but I’ve never done that. The texture of the product doesn’t feel luxurious — and sometimes a little sticky — but after you smooth it on and leave it for 15 minutes or so, it disappears into your skin and feels weightless. In the morning, those little flakes have miraculously disappeared leaving my skin smooth and soft. The price is steep at $36 per ounce, but you really don’t need a lot of product at a time. Bottom line: It’s definitely worth trying if you also have dry, sensitive skin that’s prone to flakiness. 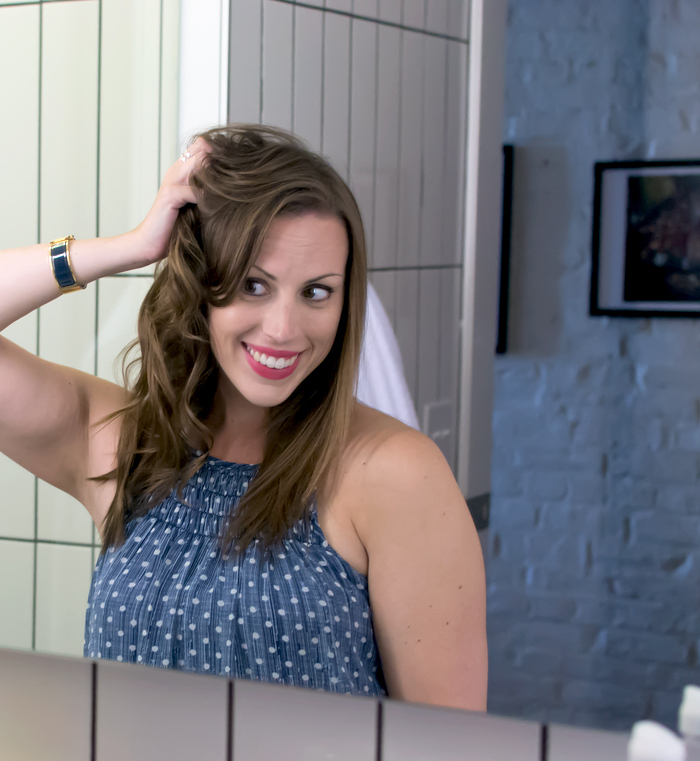 This post could really be subtitled “The Stupid Faces I Make When Curling My Hair.” Obviously, I didn’t include them in an effort of self-preservation, but Dave caught them all on camera. I look bored in some, sleepy in others, and downright angry in most! 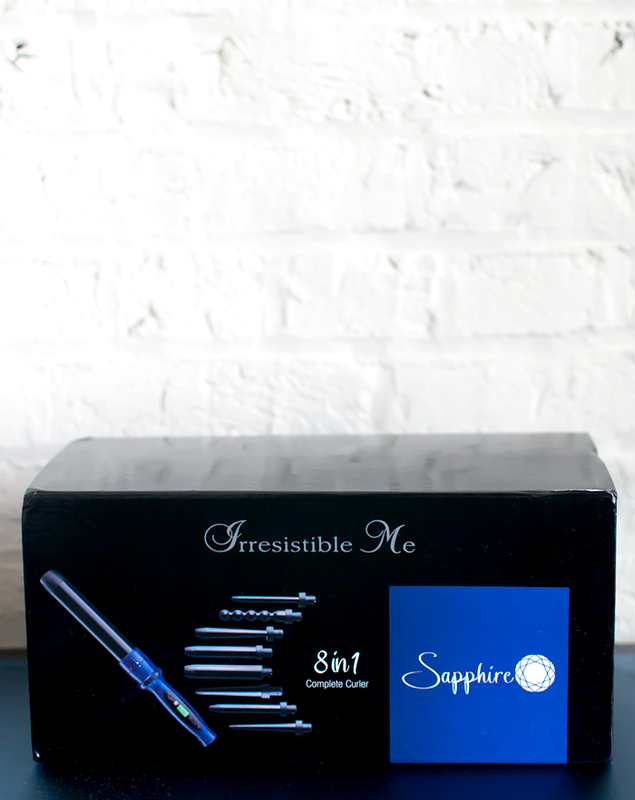 And there’s no reason for it, since this 8-in-1 complete curler by Irresistable Me is pretty amazing. 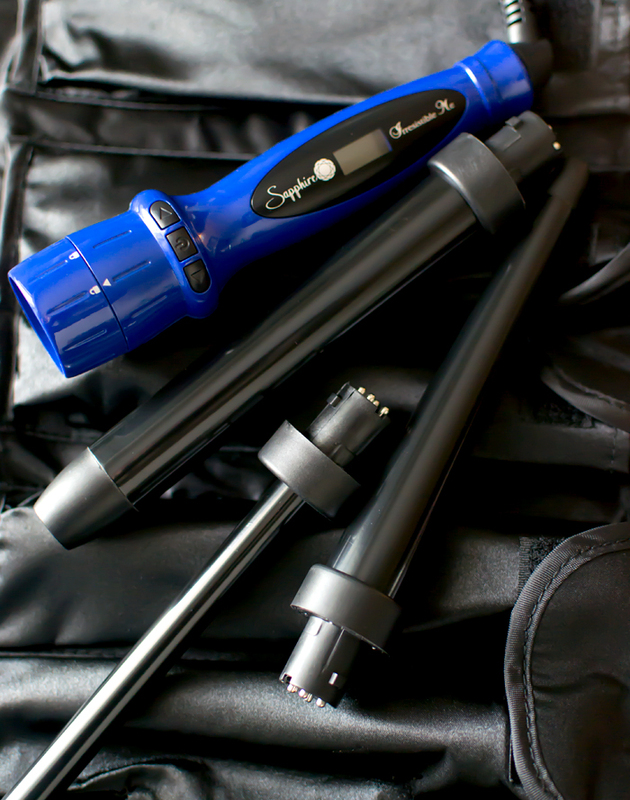 I curl my hair almost daily, so I was pretty jazzed when the company offered to send over the Holy Grail of curling irons. The kit includes a heating handle, eight wands, and a heat-resistant glove to keep your fingers from burning (safety first! ), and it all comes neatly rolled up in a nylon carrying case. (I felt like a serious beauty addict with this thing in tow.) I used it for the first time when we visited Louisville and have continued to style my hair with it since. So. Many. Choices. Anyone with hairdo A.D.D. is going to love playing with the different size barrels. Fast and even heating elements. Seriously, it took less than 30 seconds to heat up. You’ll also notice there’s a LED screen on the handle. This shows you the exact temperature of the wand. Through a bit of trial-and-error, I discovered I need to bump up the heat to keep the curls in my hair longer. I’m never able to hold curls for long with fine, straight hair, but my locks were still wavy at the end of the night. No frizzy hair. Honestly, I don’t understand how “the tourmaline technology with negative ions” keeps hair shiny and smooth, but it does. (Magic, probably.) 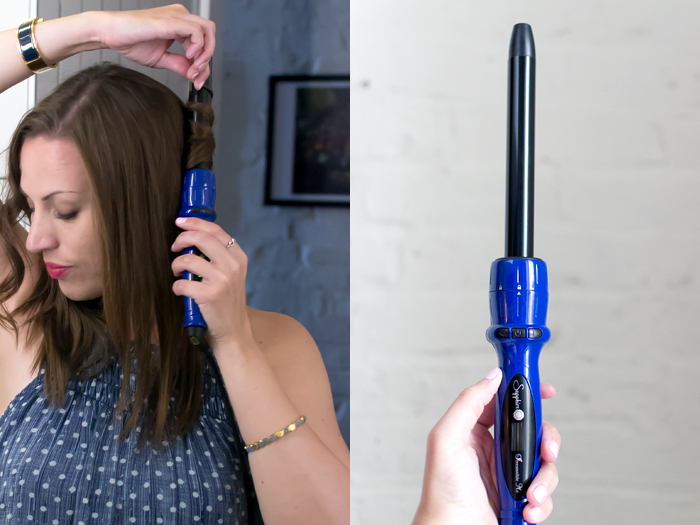 The ends of my hair usually look dried out and frizzy when using a traditional curling iron with the clamp. I didn’t have that problem with this wand. It’s an investment at $200. This works out to $25 per wand. If you have a particular barrel size and shape you never stray from, this might not be the best way to spend your money. It seems better suited for ladies who like to switch up their hairstyles on the regular. The kit is bulky to travel with. Pick one or two barrels and toss those in your luggage instead. No clamp makes burning your fingers a very real possibility. This is where that heat-resistant glove comes in. Use it.